The Sweet Water Foundation grew out of Will Allen’s Growing Power Project. The former professional basketball player-turned-urban farmer is considered a pioneer in urban agriculture. 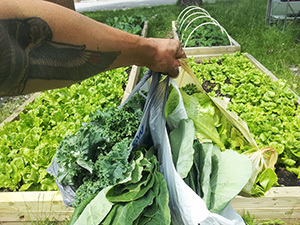 For 20 years, Allen has helped to turn food deserts into farms in Milwaukee and Chicago. James Godsil had served on the Growing Power board for 5 years, used Milwaukee Renaissance wiki power to promote Allen and Growing Power across the nation and beyond when along came Emmanuel Pratt and Jesse Blom with an idea for a nonprofit foundation that would bring aquaponics into communities and schools. Pratt focused his attention on community education in Chicago while Blom started developing connections with schools in Milwaukee, both working under the new umbrella of the Sweet Water Foundation. With funding from the US Department of Education and the US Department of Agriculture, Pratt converted an old industrial warehouse into a 2-acre aquaponics teaching center featuring four 1000-gallon tanks connected to grow beds and a graduated series of smaller tanks. There, he teaches members of the community the science behind aquaponics, from the cycling of nutrients from fish to plant to water chemistry and hydrology. If people are interested in setting up systems of their own, Pratt and his partners teach them how to do it using recycled materials. In addition to welcoming the community into the Englewood teaching farm, the Sweet Water Foundation also brings aquaponics into area schools, community centers, and businesses in Chicago and Milwaukee. As Sweet Water’s Milwaukee Director, Blom works closely with the foundation’s school partners. Teachers welcome aquaponics labs into the classroom as a hands-on laboratory for exploring science, technology, engineering, and mathematical concepts, Blom says. Students spend much of their time reading about concepts in books. An aquaponics lab, offers students the opportunity to study a complete ecosystem up close, to tackle real physics and engineering challenges, and to learn how to produce their own food. Aquaponics labs fit well into the schools because they can be completely tailored to the school’s needs and resources, Blom says. A lab can fill a greenhouse and accommodate an entire class of students at a time or it can be small enough to fit in the corner of a classroom for a few children to explore more independently. At first, Blom connected with schools one teacher and one principal at a time. However, recently they have been able to engage in partnerships with whole school districts, not just in Milwaukee but in Chicago as well. They are looking to connect with other cities. Blom and Pratt hope that students that are introduced to aquaponics in the classroom will grow up ready to support aquaponics in their communities. The Sweet Water Foundation also works with a diverse range of community groups. They have helped veterans associations, universities, and even for-profit entities such as restaurants and architecture firms set up their own aquaponics labs. And for those that are beyond Sweet Water’s physical reach, Pratt and Blom launched Aquapons.info, an online community with a digital learning grant from the MacArthur Foundation and Mozilla Foundation. On the website people can learn about aquaponics, earn digital proficiency badges, and share their experiences with each other. The Sweet Water Foundation is a nonprofit organization and is funded almost entirely by grants and contributions from individual and corporate sponsors. At one point, there was a for-profit arm known as Sweet Water Organics in the works, but that project has been tabled as Blom, Pratt, and Godsil are focusing on the foundation’s work. In years to come, they hope to expand into other cities around the country.